Simple design mixed with quality sound. This review was published on December 05, 2014. Since then, this product may have been discontinued or replaced. Pricing and availability may differ from what is stated in the review. In-ear headphones are a dime a dozen, and there are plenty of solid options out there—at a price. If you’re in the market for heavyweight in-ear headphones without blowing through your bank account, you might want to consider the MEElectronics MDuo (MSRP: $79.99). Where most in-ears in this price bracket are somewhat chintzy plastic buds, these are metal; and the pop of color is a fashionable touch. This is a great example of quality mechanics built into a simple, yet attractive, design. These durable in-ears sound great, and with a selection of silicon tips, are comfortable too. There's no such thing as perfect headphones, but these provide more than enough to justify their cost. Using dual dynamic drivers for each ear, the MDuos can simultaneously boost bass while reproducing beautiful vocals. MEElectronics focused on building a simple design that houses a complex interior to deliver reliably good sound. The MDuo look fairly basic, but their durable metal construction is relatively unheard of at this price point—where plastic is the dominant material. When you consider this, the metal casing holds an advantage that is lost on its plastic counterparts. Buyers have the option of a red, blue, or gold housing reinforcement that’s the only pop of color on an otherwise black setup. The reinforced rubber cable comes with a shirt clip, and an adjustable cable slider to ensure the four and a half foot cable will stay out of your way. Included with the MDuo are six sets of silicon sleeves: standard small, medium and large tips, a single pair of double-flange tips, as well as small and large triple-flange tips. With this selection, it should be easy for you to find a sleeve that creates a tight, yet comfortable seal. This locks in your music, and makes sure you won’t bother anyone sitting nearby. The metal casing holds a beauty that is lost on its plastic counterparts. Each of these types of silicon sleeve tips—other than providing a comfortable fit—also have different effects on the amount of isolation you can expect. For example, double-flange tips create a tighter seal and will block more of the bass and sub-bass sounds than the standard variety. The triple-flange tips will provide the most isolation, but that isolation will come at the expense of comfort, as these tips are often the most uncomfortable. The last accessory to come in the box is a clamshell carrying case so you don’t have to shove these in a pocket and can instead help these already durable in-ear headphones last even longer. Attached to the cable is an inline remote with an included microphone to control your music and calls from your smartphone. 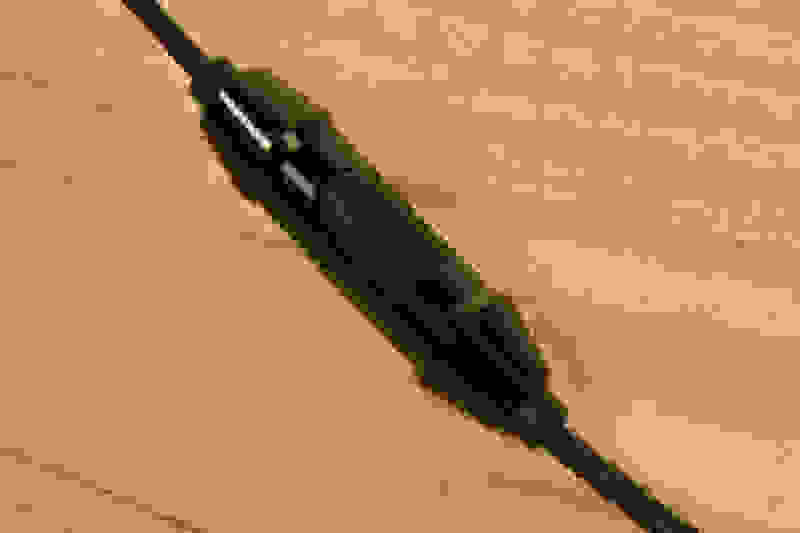 The quality of the microphone is similar to what you’d find with other earbud mics. It’ll get the job done and adds important value to an already impressive setup. The lack of volume control on the inline remote is a notable setback. I got more and more frustrated each time I had to dig out my phone to adjust the volume when I switched between listening to music and a podcast. It’s a small complaint, but one that becomes immediately noticeable if you’re coming from headphones that offer volume control. 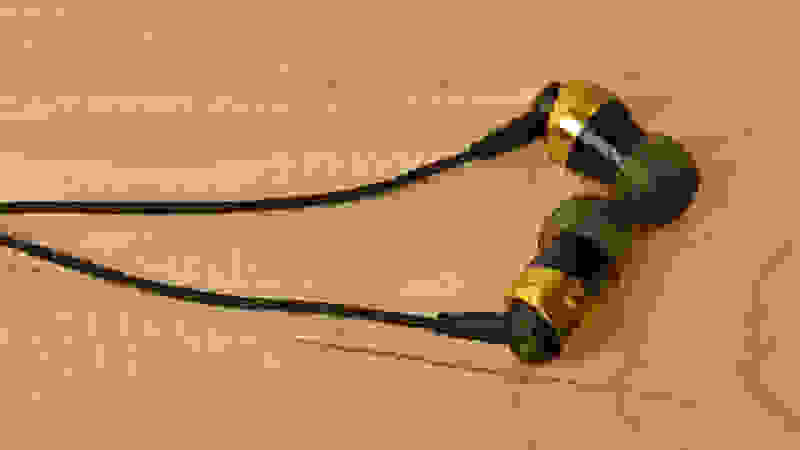 To put it simply, listening to music with these in-ear headphones is a rewarding experience. No matter what the source material is, the MDuo performs remarkably well, as it exhibits a response to compliment how humans naturally hear. We’re naturally more sensitive to some higher frequencies, so the MDuo lowers the emphasis of those notes while boosting bass, which gives each tone its due. 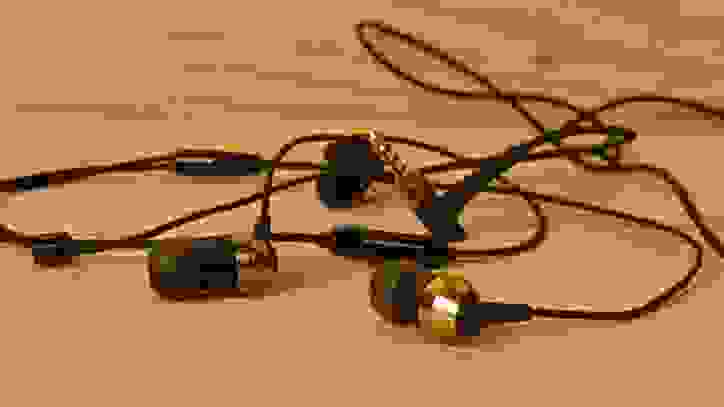 Listening to music with the MDuo is a rewarding experience. The tests we performed in our labs back up our firsthand experience—as the MDuo performs admirably—with great scores, no matter what you throw at it. You’ll want to have these on your side if you’re looking for something simple but powerful. A big factor to the solid sound is the dedicated woofer and tweeter that tag-team the audio spectrum, providing boosted bass and clear vocals. Virtually zero detectable distortion or tracking errors let you hear each channel as it was mixed. Meaning: the MDuo deliver a truly enjoyable listening experience. But if you’re looking for a flat response to help equalize or mix your own music, the MDuo aren’t the in-ear headphones you’re looking for. The selection of silicon sleeves help to provide a secure fit that helps prevent sound leakage while passively blocking sound from your ears. If you live in the city, you’re no stranger to loud noises: whether it’s the subway, the seemingly endless traffic above ground, or the work of construction crews. As I mentioned earlier, your mileage will vary based on which tip you use—standard, double-flange, or triple-flange—but you will notice these sounds generally drop to almost half their original volume, or more. In our labs, we found that the triple-flanged tips are far better at reducing bass noise, though they're not quite as comfortable as the single-flanged tips. 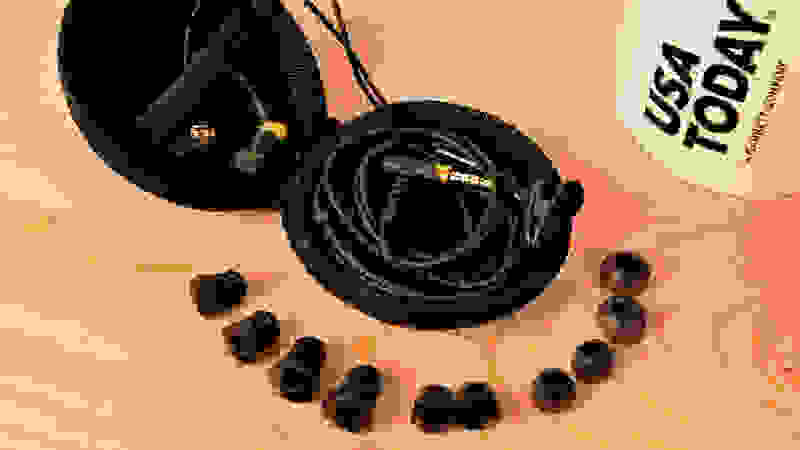 Though travelers often spring for active noise cancelers, the benefit of in-ears that seal an ear canal as well as the MDuos do is that the sound never physically reaches your eardrum. Without an active cancellation unit, you don't have to constantly feed batteries to a hungry set of cans, so in the long term you save quite a bit of cash if you're a traveling audiophile. A deal you just can't pass up. It’s clear after extended time in the lab (and listening to music at my desk) that the MDuo are heavyweights in every category that matters. The sound is solid, whether it’s the lowest lows or the highest highs. The construction is durable from plug to sleeve, and they’re just plain comfortable. This would make the $80 price tag completely reasonable on its own, but you can easily find online sales closer to $50—a bargain that’s hard to argue with. But keep in mind, there isn’t any in-line volume control and you’ll have to sacrifice comfort if you want true isolation with the triple-flange tips. Finding the silicon tip that's the most comfortable and provides the right amount of isolation takes some time. But the results are worth it. These in-ears are unquestionably for the casual listener, and not really geared towards replacing a set of high-end over-ears. If you're doing a lot of your music listening at home—or willing to invest more to get the best performance possible—you'd probably be better served picking up a more comfortable set of over-ear headphones. However, if you find yourself bumping tunes outside or at the office, it's tough to argue with what the MDuos bring to the table. Still, these in-ears may be a tough purchase for some people that are looking for a smaller pricetag. If you’re all about that bass, the MEElectronics M9P 2nd gen. is a cheaper alternative (MSRP: $39.99) that puts more emphasis on bass without boosting the higher frequencies as much as the MDuo. If you're super-strapped for cash, the ultimate value in-ears are easily the Monoprice Enhanced Bass Hi-Fi.